Do you know what is easy, cheap and super cute? Iron-ons! I “made” two cute baby gifts tonight. I got the one above and I put on an onesie. So cute right? I also made this “priceless” hat. 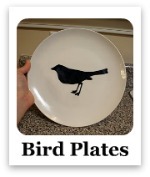 Have you made any Christmas gifts yet? And Kimba for DIY Day! 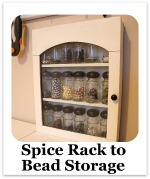 And at Today's Creative Blog for Get your craft on! 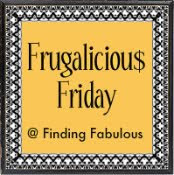 And lets just round out the week with Jane at Finding Fabulous for Frugalishish Fridays! And over a Hope Studios for the Hand Made Christmas Party. Oh we aren’t done with the round ups yet! We still have Cyber Monday! Cyber Monday was coined a couple of years ago as online retailers noticed a spike in online shopping the Monday after Thanksgiving. The thought was that people were back at work, bored, and started their holiday shopping online. It is one of the biggest online shopping events of the year. I am going to run through some of the best Cyber Monday deals that I have seen released so far by retailer. Sound good? Ok here we go! Overstock showed up to play this Monday. I would head there first as they had better prices than both Amazon and Walmart on the things I checked this evening. But, before you go to Overstock, make sure you first go to Bing.com, click shopping, click Cashback stores, and go to Overstock.com through Bing so you get 15% cashback. If you remember from my post on White Goods for BF that I was annoyed that no one offered a 1000 thread count sheet set. 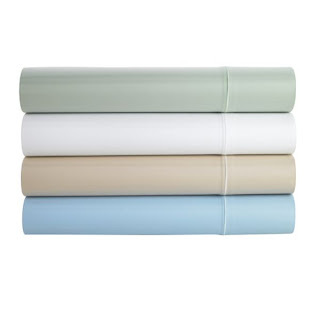 Well, Overstock.com has this lovely 1000 count set in Queen, King, and California King for $64.99. 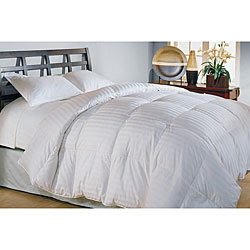 They are also offering this Oversized 500 Thread Count White Down Comforter for $54.99. 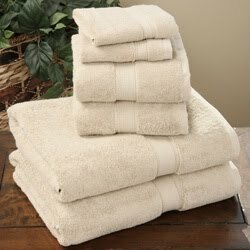 Or this 6 piece 800 gram Egyptian Towel set which includes two bath towels, two hand towels, and two wash clothes is only $32.99. It is offered in 16 different colors. 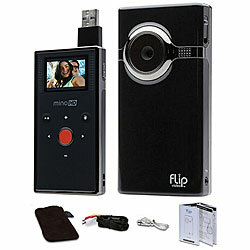 They are also offering this Flip Mino HD Camcorder for $139.99 – you have to put the product in your cart to see the reduced price. This is a super easy Camcorder to use and has built in software so you can upload to the web quickly. They also have this Toshiba Blu-Ray Player for only $99.99. They also have this great Wolfgang Puck 7-cup Food Processor for $49.99. Normally it is around $150.00. 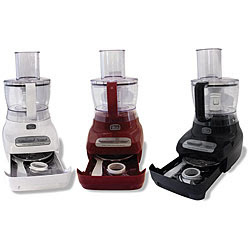 Now it is refurbished, but that is a great deal on a 7-cup Food Processor. 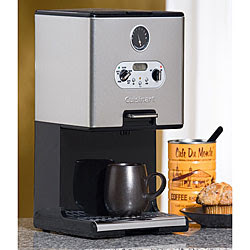 Or this 12-cup Cuisinart On Demand Coffee Pot for only $49.99. 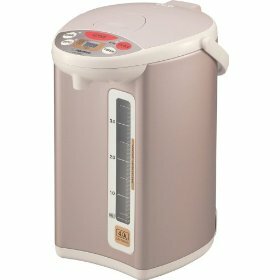 This bad boy makes the coffee keeps it hot and lets you dispense it a cup at a time. 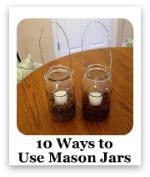 No more burning coffee smell and you don’t have to make multiple pots through the day! Amazon.com has their Cyber Monday Sales up now too and they are still running their lightning deals at throughout the day. 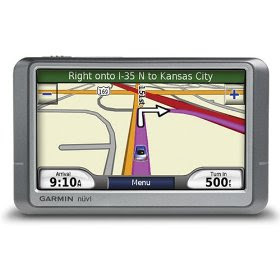 First thing I saw that looked good was this Garmin Nuvi 260W Widescreen GPS for 50% off. It is only $114.99 and is listed as one of their “Hot Deals” so if you are in the market, I would get in on this one soon. They also have hundreds of DVD’s and Blu-Rays at significantly lower prices. Check out the best deals here. And I know I posted in my wish list post but seriously check out the $5 Magazine Subscriptions that they have going on. House Beautiful and Real Simple are included! Check out this Henckel's 10-piece Knife Set! Normally $206.99 Macy’s has this marked down to $75.99 which is the cheapest I could find this online. They also have this nice Men’s Kenneth Cole Pea Coat marked down from $225 to $69.99. That’s all I have for tonight. Since I have to work tomorrow (bah!) I won’t be able to stay on top of all of them for you, but I would check your inbox in the morning to see if any of the places you frequent regularly send you Cyber Monday deal info. Feel free to come back here and leave a comment if you find anything fabulous! 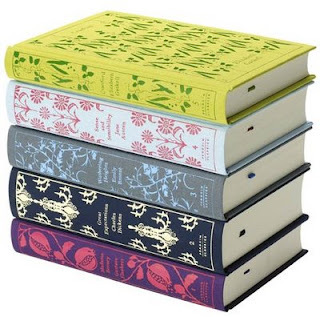 Wish Lists – What’s on yours? So as I was browsing through Roll Call on SITS for the SITS sharefest, I came across Tammy’s Blog (visit her here). She wrote a post on wish lists, shared hers, and did a McLinky so everyone else could do the same! I thought it was a great idea especially since people keep asking me what I want for Christmas and I get performance anxiety. You know, when someone asks you what you want and you end up with a totally blank mind. Or you can only think of 5 piece king bedroom sets (then again maybe that is just me) or other things that are totally impractical. So I decided that I would sit down and really think about it. I have an Amazon wish list that I didn’t really keep up. I did go through and purge and restart it this year but it is a random mismatch of so many things. I have added a few things that I have been considering and I figured I would share in case there is anything I want that might trigger a good gift idea for someone you know. My Crockpot is still in VA (if your not up on “the situation” read about it here) and this time of year is when I love making roasts and such. 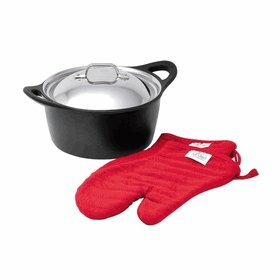 Since I don’t have a dutch oven yet, I think this little beauty would make a great addition to the kitchen. I have the grill pan that is made of the same aluminum non-stick material so I know it would clean really easily. Bonus - it is on Amazon for $59.66 right now from one of their affiliates! Turns out this is a freebie from All Clad if you buy more than $500 in All Clad merchandise so people are doing that and then turning around and reselling them. It works for me! Normally these are $160. 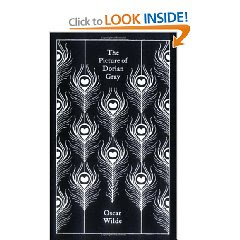 The cover of the Dorian Gray book is probably my favorite. This is one of my extravagant wishes. So while we were up in PA for Thanksgiving I got really accustomed walking over and instantly making myself a cup of tea with my uncle’s Hot Water Dispenser. For those of you who don’t know are not familiar, it is a little gadget that sits on your kitchen countertop and with a press of a button will give you hot water that has been boiled and kept at a specific temperature (specified by you). My grandmother and father all have them too (as that side of the family are pretty big tea drinkers). I have kinda thought it was a little much – I mean come on how hard is it to boil water. But after having it “on demand” and being able to enjoy a cup of tea at any point I admit I got a little spoiled. So it is now a “wish”. Ok so I know this is not at all “green” but I love getting magazines. Amazon is having a sale right now where you can get a year for $5.00 on a bunch of titles. Personally, I want to be curling up with some issues of House Beautiful sometime soon! 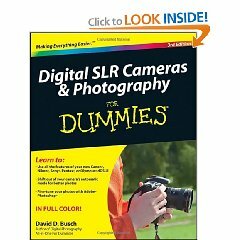 I have a great Digital SLR (a Sony A350 – it is the bomb!) but I pretty much keep it on Auto because I don’t know what all those other buttons and knobs do. 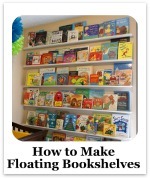 But I would like to, which is why I think this would be a good book for me. This is my final extravagant gift. I have one that hubby got me 3 years ago for Christmas. It is the familiar black and white pattern and looks exactly the same after almost three years of daily wear and tear as it did when I opened it up. And I am not gentle with this bag. It gets slung around, dropped, kicked, and the occasional coffee spill – but it looks GREAT. 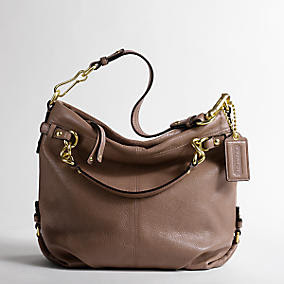 It is the durability of Coach that gets me every time. 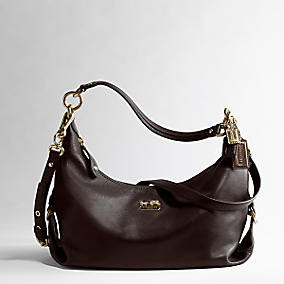 In the same span of time I have gone through numerous other purses – but mine is still classic, still beautiful. What about you? What is on your wish list? Head on over to Tammy’s and join the fun! Ok! Here we go with the final day of Black Friday Deals! I have had to hijack my lil Bro's computer to get this final post out. So thanks for bearing with me through this! Let's face it ... the real reason people go out on Black Friday is for the Electronics! 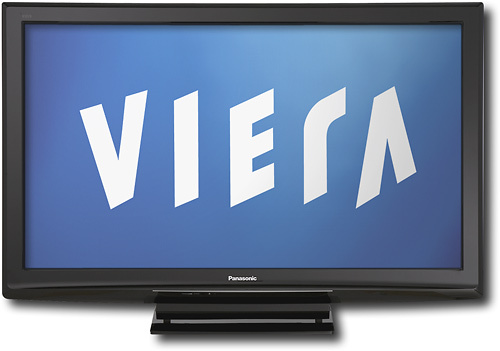 TV's, cameras, blue-ray players and gaming systems. So I same as days past, I am going to run down the best deals out there - including the ones you can get RIGHT now so you can sleep in tomorrow! I am not really going to split these into the regular Doorbusters and All Weekend Deals since the Electronics are normally what sells out first. Ok - Electronics are the mother of all Doorbusters. So let's do a run down of what is worth standing in the cold for tomorrow and what you can get online. The best deal out there for tomorrow morning is this Sony Blu-Ray Player from Walmart with BD Live for only $118. That is about $50 off the regular price and is a fairly highly rated machine. 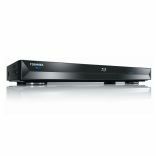 Right now though, you can get this LG Blu-Ray Player at Newegg.com for $98.99. This player normally runs $169. 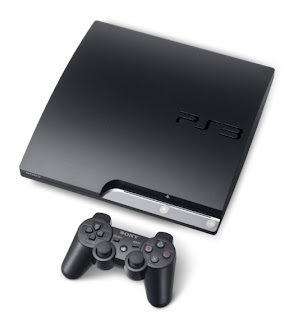 Of course, you could also get a PS3 (which has a built in Blu-Ray Player). Walmart will have a bundle out tomorrow morning with the Infamous, Arkham Asylum and 'The Dark Knight' Games for $299. 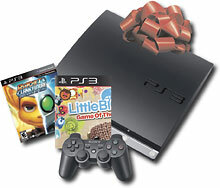 Right now, you can get a similar bundle on Bestbuy.com for $299.99 with two more kid oriented games. Wii's have just had a price drop and I know I got several questions about where to get the best deal. Now you can get a regular Wii for $199 everyday. But to get a couple games and extra controllers it is going to bring you up a little higher. Walmart will have a bundle out tomorrow that will have two games and and extra set of Nyko controllers for $249.99. 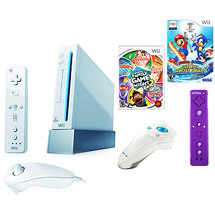 However, right now on Walmart.com you can get this set that comes with the Wii Remote game and an extra set of controllers for $279.99. There are some good deals out there on TV's. But I have to say that I am very impressed with the online offerings today. Newegg.com has this LG 32" 1080p LCD TV for only $399.99. 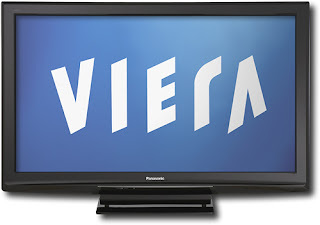 Best Buy will have a 50 inch 1080p Panasonic Plasma TV tomorrow with a Free Blu-Ray Player for $999. 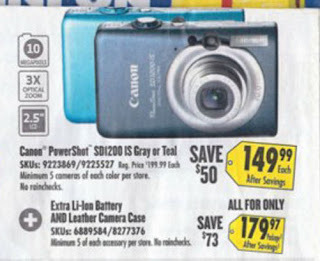 Target has a nice deal on a Nikon 10 megapixel camera that is only $88. Sorry I don't have a picture of this one, but you can see it on the front page of their ad today. One of Cnet's best deals for tomorrow was this Canon Camera at Best Buy for $149. You can get the exact same camera today from Newegg.com for the same price here in pink or here in gray! Newegg.com also has this great deal going right now on this Nikon D40 bundle for $439.99. Whew ... that is a pretty good run down. I will check comments all day so let me know if I missed anything you were looking for in particular! I would also highly recommend getting on Amazon all day long as they are showcasing several limited time offers all day long. Check it out here! Happy Shopping and more importantly Happy Thanksgiving! Whew! Our travels were a long and we have finally made it to PA for the weekend. 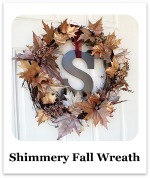 Bear with me over the next couple days as I get these posted in between turkey and too many cookies! I love hearing that you guys loved the deals! 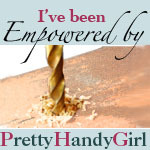 If you missed my Overview or the Home Improvement Store Deals make sure to check them out! I also wanted to say that I noticed that some of you expressed hesitation about going out on Black Friday because you were afraid people would be mean or crazy. I have to say, I think most shoppers have gotten a little mellower over the years. I remember going out 10 years ago and people were crazier than what they are now. Part of what helps that is that retailers are being very clear about limits on doorbusters and have learned more about crowd control. That said, you are going out into a world were inevitably you are going to run into a jerk and since more people are out and about on Friday your changes of that have increased substantially! Just remember that if you kill em with kindness that not only does it keep you from becoming a grouch yourself, but it will provide the rest of your level headed early morning companions a giggle and a good example. Now, back to the shopping! Again, just like yesterday, I am going to split these deals out into two sections each day. First, we will start with Doorbusters (which are likely to sell out soon) and follow that up with the all weekend deals. Like I said yesterday, all weekend deals can sell out just as fast. There are no promises made on Black Friday! Now I don’t plan on featuring a lot of “hot” deals here today. Why? Because there are very few deals on White Goods and Home Décor that warrant you standing outside to wait for a store to open. That was not necessarily true for the last two years. Target had been running a pretty predictable 1000-thread count Sheet set for around $50 which was a killer deal. 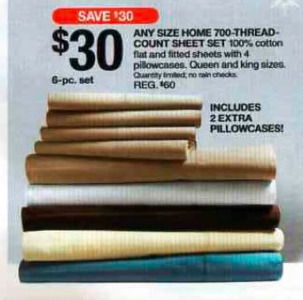 However, they have cheaped out on me this year and are only offering a 700-thread count for $30. I will give them credit for the fact that this set does include two additional pillowcases since last year the sets did not include any and you had to by them separately. These will and do sell out within the first two to three hours, so if you are in Target early be sure to swing by the home section and see if there are some to pickup. They are normally on the end of an aisle so keep your eyes peeled. 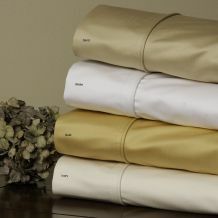 Personally for the money, I would skip almost skip the drama and roll over to Kmart.com and pick up this County Living 800 Thread Count set for $49.99 today. It also has the extra pillowcases. Both Kmart and Sears are offering this as a Doorbuster but if you can click and get it today I would! 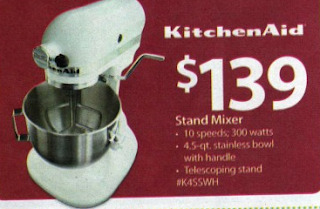 Another item that people have fought over to get are the Kitchen Aid Stand Mixers. Walmart has the best deal out on Friday with the smaller 4.5 quart Ultra Power Stand Mixer for $139. They don’t state any minimums, but the whole ad is layered with disclaimers that all item are Limited Quantities while they last. 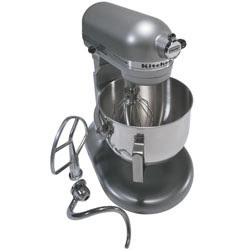 Again, I would skip the drama and head straight over to Kitchen Aid’s fabulous Outlet site and get this Refurbished 5Qt Professional Heavy Duty Mixer for just $199. 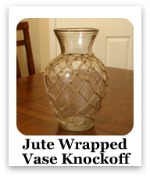 This number normally runs $419 at regular retail and they have it in several colors. 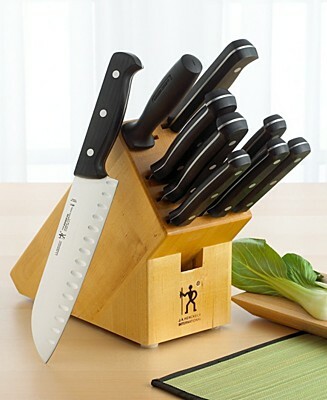 You can also get the popular Artisan Model in about 14 different colors for $189 on the same site. 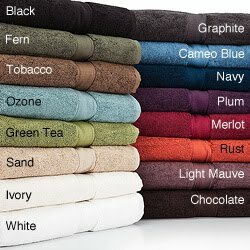 There are a couple of stores, Kmart and Target that are going to have $1.50 Towels for sale which could be good if you needed to pick up some basic extras. But there wasn’t anything that screamed stand outside to me. Personally, I feel that if you are out and about Friday at these stores it is always well worth it to take a spin through the housewares section to see what is available. You never know when you can stock up on some basic essentials! I will work on getting together all the best Electronics deals between today and tomorrow (including Wii's!). Keep checking the Black Friday devoted websites to make sure you get the most up-to-date deals and any late releases from online retailers like Overstock and Amazon. One from Jessica Jones was do I think shopping at Black Friday is worth it if you shop sales all year long? My answer to that is yes, if you shop the right things. Are you going to find great deals on things that are pretty cheap normally? No, it is the big ticket items where you are going save major bucks. That said, if you are going to fight the crowds and get up that early, check out the cheaper stuff just to make sure you aren’t walking by something that is a good (but not jaw dropping) deal and conveniently right next to you as you walk to the checkout. 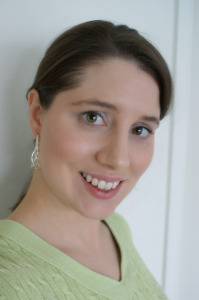 Love Where You Live (a new fab blog that I have just discovered – check out her Mood Board contest!) also wondered why it was called Black Friday. Well, the legend holds that once upon a time retailers didn’t make a whole lot of money until the Christmas season started. The day after Thanksgiving became the day where retailers went from being in the red, or negative numbers, to black healthy happy profits. Unfortunately, these hefty sales are baked into their quarterly numbers year after year and they have to continue to drive those same comparable numbers to make their shareholders happy. This is why you end up with some crazy deals that last a limited time and have a limited quantity. They want you to come shop in the store, but can’t afford the money they would have to lose to have enough of each item there all day for everyone who wanted one. Make sense? If not keep throwing me questions and I will answer them every day. Now, back to the shopping. I am going to split these deals out into two sections each day. First, we will start with Doorbusters (which are likely to sell out soon) and follow that up with the all weekend deals. Now – all weekend deals may sell out just as fast if there are not a lot on hand and you guys can’t come back and flame me if you head out to these stores at noon on Friday and come back empty handed! Deal? Ok … then let us continue! There are a lot of nice deals out there at Home Improvement stores. However, there are only a few things at Home Improvement stores that you need to get up and stand outside for. Those would be power tools and large home appliances. Now both Lowe’s and Home Depot have big disclaimers across the top of both of their ads screaming that ALL items featured are while supplies last and that quantities are limited. This basic disclaimer says if you get one you are in luck, but you probably cannot backorder it. This year, there were not too many fantastic power tool door busters. 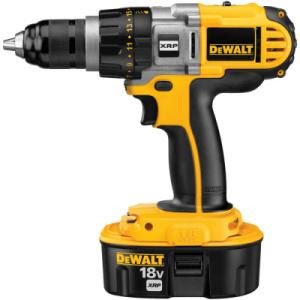 That said both Lowe’s and Home Depot have a $99.99 18 V DeWalt Cordless Drill/Driver which is normally $279. 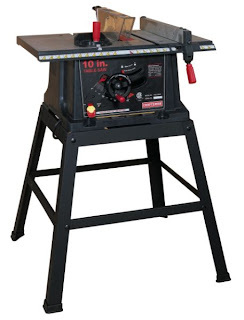 Sears (who opens at 4am) also has a deal on a 10-inch table saw with stand for $89.99 normally $149.99. 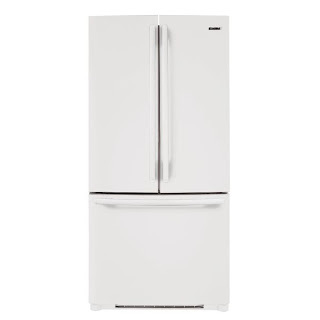 For appliances though, there are a couple different deals that are pretty hot! 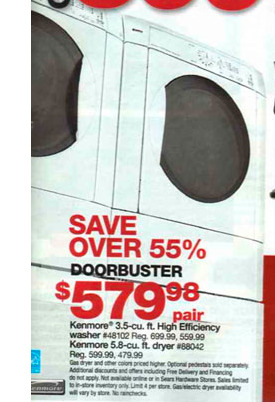 Sears has a front loading Washer/Dryer combo for $579.99 for the pair. They do state that the offer is limited to 4 per store and that a gas dryer is going to have a higher price. It also does not include the pedestals. However, that is a smoking hot price! 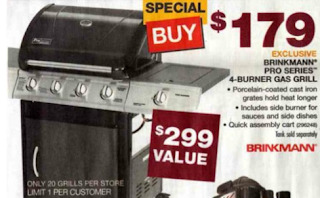 Sears is also offering a 22.6 cu. 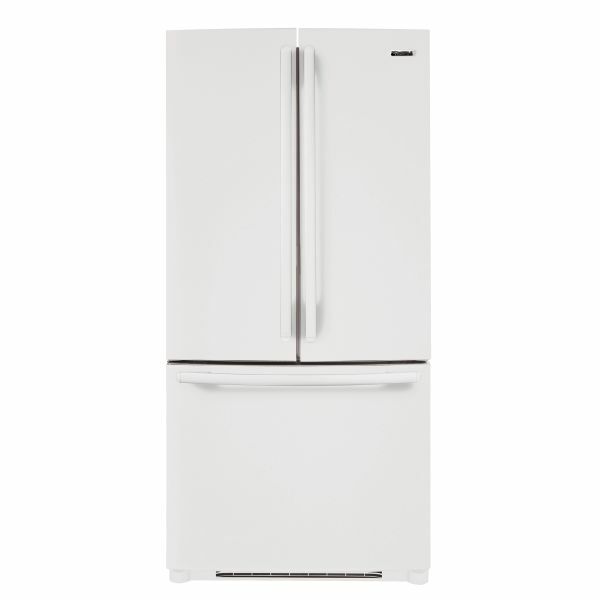 Ft. French Door Bottom Freezer Fridge in Black, White or Bisque for $749.99. It is normally $1499.99 so that is at 50% off. A silver stainless version is available for $899.99. The ad is pretty sketchy about how many of these will be available in the base colors, stating that there are approximately 2 per store but doesn’t specify if those are by color or not. Home Depot has a pretty hot deal as well. A nice front loading LG washer dryer combo for $798. The small print does say while supplies last but does not specify if there is a minimum per store. A gas dryer is going to run you a little extra and the pedestals are sold separately. Ok, now we are getting into the good stuff. To me, unless you really want one of those deals above one of these stores should be a second or third stop on your list simply to pick up some of the great deals listed below. 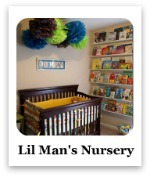 For some great little gifts check out these nice pickups! I love this little square toolbag! 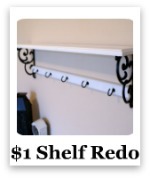 It is $9.98 at Home Depot. 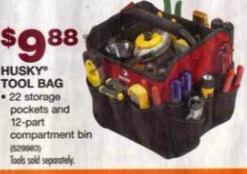 Drill/Driver sets are also a great pickup for the handy person in your life (even if that is you!). 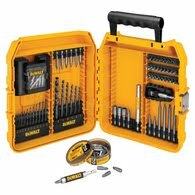 The best deal out there is a 100 piece Dewalt drill set that is normally $49.99 and is $19.97 at Lowe’s. This 5 piece pliers set at Home Depot has the ever elusive groove joint pliers which normally will cost you just as much as the full set at $9.97. 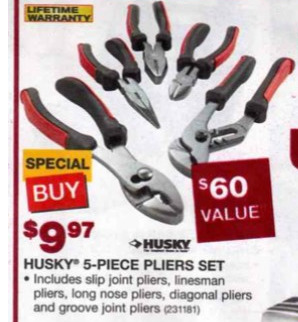 My hubby – who is a certified ASE car mechanic – saw that set as I was scrolling through the ads and commented that he would buy that set if he were out and about. Now for those of you looking for the big guns keep on scrolling! So the hubby used to work part time at Home Depot while he was in school. When I started talking about doing crown molding projects he said we would need two things. 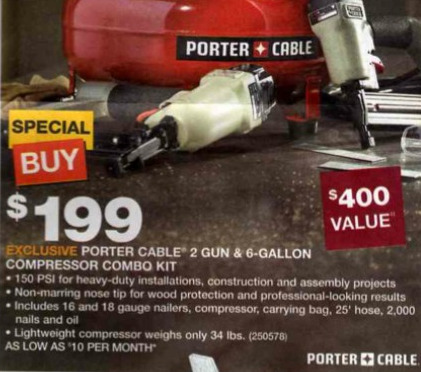 A miter saw and a compressor with nail gun set. He would not let me even consider buying a compressor and gun set until Black Friday because of the ever so predictable and fantastic deal that Home Depot has on this Porter Cable compressor combo that they offer every Black Friday. And for $199 if you have looked at nail gun/compressor sets before you will see that this is about half what they normally are. To finish up your dreams of beautiful crown molding, you need to pick up this great 12 inch compound miter saw from Sears at $179. It is regularly $279 so at $100 bucks off it is a good deal. 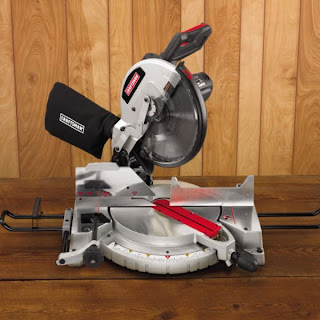 Sears is also offering 20% off all blades with any purchase of a saw so you can get your cut on at a discount as well. Home Depot, in my opinion beat the pants off Lowe’s this year. They also have this great deal on this Consumer Reports Best Buy Brinkman grill. I bought this for the hubby for his birthday two years ago for $299. On Black Friday, you can get it for $179. It is a great little grill and really is a value for the money. They do note that there are a minimum of 20 per store, but that is a high minimum so you will probably be able to get one of these pretty easily! Another of the Home Depot deals, that I sat up and took notice on was this bad boy. 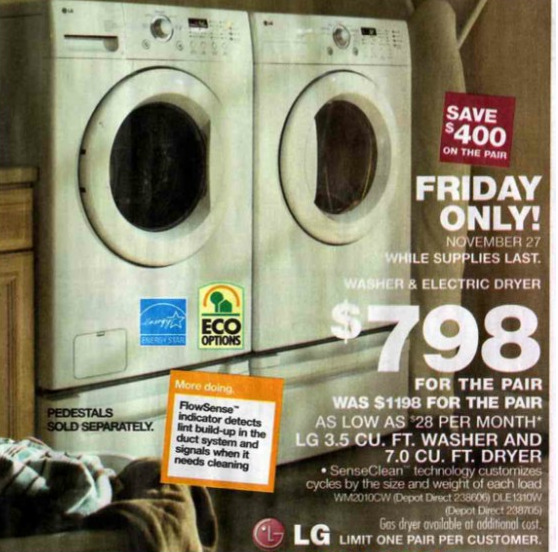 These Maytag’s normally run $899 for the colored versions. However, right now (today, now, this minute!!) you can get the white version that will also be $499 a piece on Friday for $499 today! 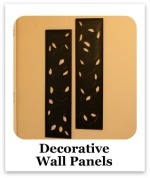 They are up on HomeDepot.com here! These also have a 5 out of 5 star rating. 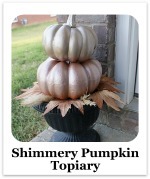 Of course, the pedestals aren’t included but this is a GREAT buy! 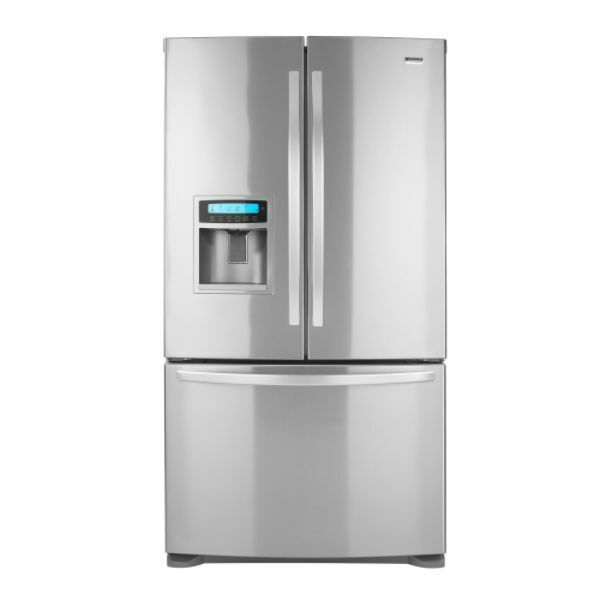 Finally, if a new Fridge is in your future, you need to check out the Kenmore Elite Stainless Steel model that Sears is offering for $1599. I know, $1599 isn’t cheap. However, that is $1200 off the normal price. 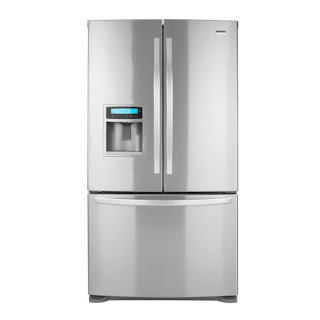 It is a 25 cu ft Fridge with a built in LED water and ice in door system. This is one of those deals that is SOOO worth it if you are in the market for a new one! 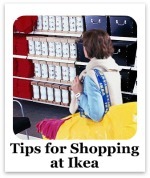 I hope that helps you with your Home Improvement type shopping. Did you see anything that made you decide to go out? Are you looking for items I didn’t showcase? 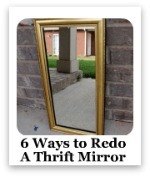 Leave me comments and I will be glad to help you try to find what you are looking for! P.S. Tomorrow, I am going to negotiate the somewhat more intrepid White Goods (sheets, towel, home décor) which are sometimes false deals. I will wrap it up Wednesday with an Electronics overview and then spend Thursday mapping out some good gift deals. We are traveling Tuesday night so if I don’t get it posted late Tuesday expect two posts to come through on Wednesday! Want me to review something specific? Just let me know! Could I Like the Color Orange? Unbelievable lighting deals at Macy's!